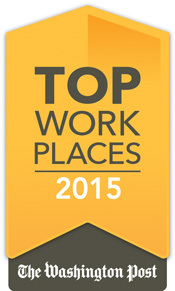 LINTHICUM, MD, June 19, 2015 — NFM Lending is pleased to announce that it has been ranked a 2015 Top Workplace in the Washington, D.C. area by the Washington Post. NFM Lending received the award at a ceremony held on Thursday, June 18, 2015. Since its founding in 1998, NFM Lending has grown from a small mortgage brokerage to a lender with retail branches throughout the United States; the company has locations in 29 states, with 7 locations in the D.C. area, including its corporate headquarters. NFM prides itself on its company culture. Each year, the Washington Post distributes a survey to the employees of Washington, D.C. area companies, asking them to evaluate their workplaces. The survey asks participants to rank their companies on quality of leadership, work-life balance, pay and benefits, and more. This year, NFM Lending was among 150 small, midsized, and large companies that made the final cut for inclusion on the Top Workplace list. NFM Lending was also named a 2015 Top Mortgage Employer by National Mortgage Professional Magazine earlier this year, and a Top Workplace by The Baltimore Sun in 2012, 2013, and 2014. NFM Lending is proud of these accomplishments, and the work its team does to make it a Top Workplace.